When an artist of the global stature of Rokia Traoré makes one of her rare visits to Vancouver, you postpone anything else you planned and get out to see her. Daughter of a career diplomat, she travelled widely in her youth and as expressed in her musical style, she is a true cosmopolitan. While still largely faithful to her Malian roots, Traoré broadens her own musical palette by embracing musical forms outside her own culture. Her latest album, Beautiful Africa, is a fusion of rock and authentic Malian music. Sporting a shaved head and a black sleeveless dress, Traoré stepped onto the stage joined by her six-piece band, which includes countryman Mamah Diabaté , two female backup singers, and surprisingly, three Italian musicians. 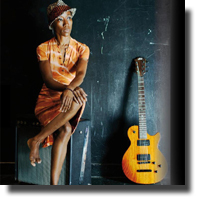 With nonchalant melodic charm she picked up her Gretsch electric guitar (George Harrison’s first choice of instrument) and opened with a couple of affecting songs sung in the Bambara language. The first, featured side musician Mamah Diabaté on n'goni (the instrument looks like a primitive version of the European lute. It has oval-shaped wooden body and narrow neck). The Malian singer ended the first set, which lasted all of 35 minutes, with “Mélancholie” sung in French. As its title suggests, the song is a poignant reflection on heartbreak and isolation. The second set was to be a much livelier selection, with less self-accompaniment on the Gretsch and more kinetic movement by herself and her back-up singers. A pounding, impassioned rendition of “Beautiful Africa” restarted the show. Sung in Bamanan, French, and conspicuously in English, Traoré projected a powerful declaration of her love of Africa. The songs sung in French aside, it’s not likely that too many in the audience would understand what her lyrics were about. Perhaps she really believes her music needs no translation. On stage, Ms. Traoré is certainly a spellbinder having no need to pander. After an appreciative ovation by a spirited crowd, Traoré returned with the entire band for a surprising choice of an encore: a peerless interpretation of Billie Holiday’s “Gloomy Sunday” - it was anything but that.